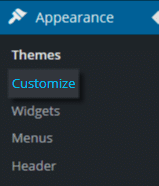 The Free Spirit theme includes an image which displays as a background image in the Front Page 1 widget area. You can upload up to 3 images or upload only 1. If more than one it will display as a slideshow. Appearance > Customize > Front Page Image. A thumbnail sized version of the default, pre-loaded images will be displayed. To set your own images in this area click Change Image button underneath the image. A popup will display allowing you to upload the image of your choice from your computer, or to find one directly in your Media Library. If desired, you can remove the image by clicking the Remove button.